Non-dairy toppings remains a fragmented marketplace. However, in spite of a large number of players vying to increase their stronghold in this market, Rich Products Corporation and ConAgra Brands Inc. have been successful in maintaining their strong presence. The prominence of these two companies in the non-dairy toppings market can be analyzed from the fact that collectively, these two account for about one-fourth of the revenue share. North America, particularly the United States, continues to be a key market for these two players – nearly 22%-29% of Rich Products Corporation’s revenues come from North America, whereas the percentage is in the range of 33%-41% for ConAgra Brands Inc. 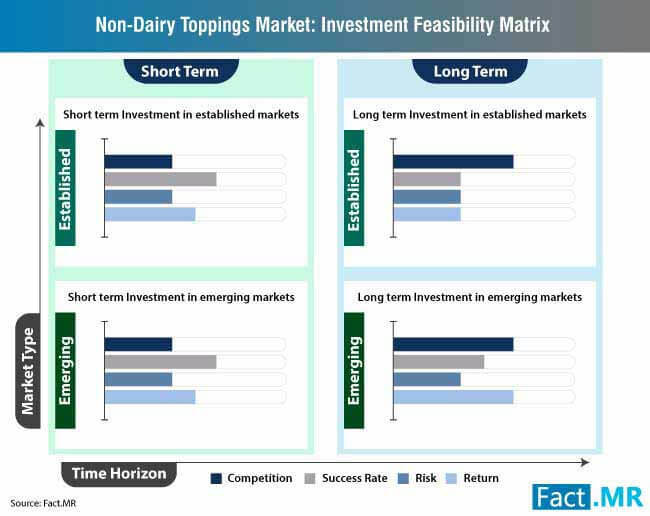 These Tier 1 companies in the non-dairy toppings market have been focusing mainly on acquisitions and joint ventures to expand and maintain their market presence in the developed economies. Forming alliances across the Asia Pacific and other emerging economies to tap potential growth and profitability also remains a key focus area for these companies. 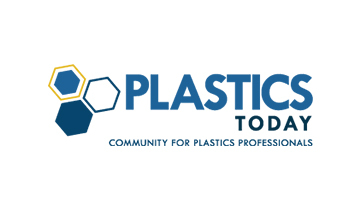 Strong distribution networks are key to market consolidation in the non-dairy toppings market, as hurdles in manufacturing and storage of almond milk have created challenges for players across the spectrum in the past. Tier II companies involved in the production of non-dairy toppings are focusing on expanding their global footprint by targeting emerging economies in the Asia Pacific excluding Japan (APEJ), especially India. International non-dairy toppings companies are acquiring shares in Indian food companies to expand their business activities in India. Being a land of heteregenous demographic, the country is expected to offer potential growth avenues for dairy alternatives such as non-dairy toppings in the forthcoming years. Against this backdrop, Tier II players are establishing new plants in the country to grasp healthy opportunities with respect to demand and sales of non-dairy toppings. For instance, ConAgra Brands Inc., has become a majority owner of India-based food company – ATFL (Agro Tech Foods Limited). 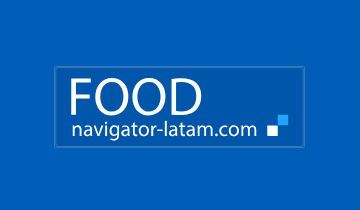 Expanding international business being a major strategic plan of ConAgra, the company is looking forward to work and support ATFL in expanding business operations as well as maintain investment in the country. Likewise, Rich Products Corporation has opened a new plant in North India to produce frozen non-dairy toppings, leveraging the country’s attractiveness in the food and beverage industry. The company had initiated a joint venture with Graviss Group of Mumbai to form Rich Graviss to manage operations in India. The increasing demand for vegan food products have fuelled the demand for non-dairy toppings across the globe. Millennials being the central drivers, the trend of increasing preference towards non-dairy toppings across developed and emerging economies is expected to drive the non-dairy toppings market growth. According to Good Food Institute and PBFA (Plant Based Foods Association), the sale of plant-based products rose by 8.1% in 2017 in the United States, consequently presenting potential avenues for non-dairy toppings producers. 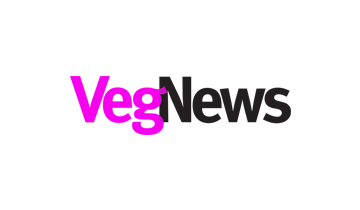 The growing veganism trend is not limited to developed countries alone – China is quickly emerging as a lucrative market for vegan products. Significant rise in lactose intolerant population is expected to drive the demand for plant-based food products such as non-dairy toppings. According to NIDDK (National Institute of Diabetes and Digestive and Kidney Diseases), about 68% of the global population is facing lactose malabsorption leading to lactose intolerance. Growing lactose intolerance has triggered demand for lactose free products such as non-dairy toppings, in turn fueling their adoption at a significant pace. Apart from nutritional benefits, the demand for non-dairy toppings is also influenced by their production methods. Producers of non-dairy toppings are adopting UHT (Ultra High Temperature) technology. UHT provides non-dairy toppings, especially whipped creams, with higher stability, prevents syneresis and enhanced fat reduction. Moreover, non-dairy toppings produced from UHT do not curdle and can be combined with any color or flavors. Benefits of UHT-processed non-dairy toppings are likely to impact growth of the non-dairy toppings market during the forecast period. The non-dairy toppings market report covers analysis on various key players involved in the production and distribution of non-dairy toppings across the globe. 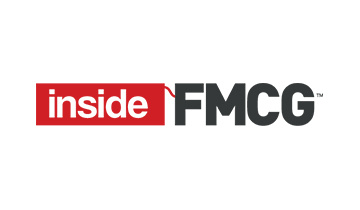 Profiles of key companies such as ConAgra Brands Inc., FrieslandCampina Kievit, and Puratos NV have been included in the competitive landscape section of the report. 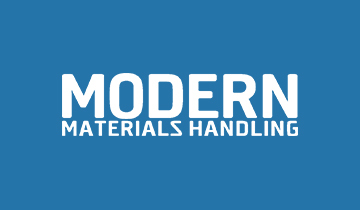 Key facets including growth strategies, financials, product portfolios, innovations and developments and overall SWOT of these companies is covered here. Companies in the non-dairy toppings market have been focusing on product line extensions and development of new non-dairy toppings to serve the vegan population worldwide. For instance, Reddi-wip, a brand of ConAgra Brands Inc., has recently launched non-dairy coconut and almond varieties in a bid to cater to the increasing demand for plant-based toppings among vegan consumers. According to the president of ConAgra Brands Inc., this move can address a broader consumer base on the back of growing demand for non-dairy toppings. FrieslandCampina Kievit launched a high performance whipping agent in powder form – “Vana-Monte DP570” – in 2017. This halal and kosher certified product has opened new avenues for the company as a better alternative to liquid non-dairy toppings. Moreover, Vana-Monte DP570, featuring a longer shelf life, has provided new opportunities for FrieslandCampina Kievit in warmer regions such as the Middle East and Africa. 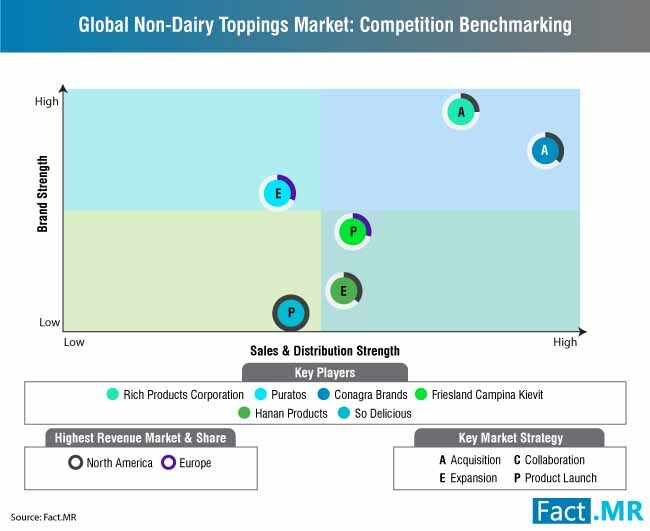 Companies in the non-dairy toppings marketplace are focused on investing in growth strategies including joint ventures, strategic acquisitions and new plant development. Puratos NV is planning to invest US$ 1.6 million for facility up-gradation in Canada to support launch of its novel Topfil range of fillings. It has also signed a strategic joint venture with Bano Group to enhance its presence and promote its non-dairy toppings product portfolio in the countries in the Middle East and Africa (MEA) region. In addition, this joint venture shares commonalities such as bringing innovations in non-dairy toppings with a customer centric approach. ConAgra Brands Inc., has announced its plan to acquire Pinnacle Foods for US$ 10.9 billion in order to tap potential opportunities in the frozen food sector. The outcome of the acquisition could make ConAgra a second largest frozen foods player in US after Nestle, which is likely to favor its frozen non-dairy toppings segment. Non-dairy toppings are dairy-free products, used as alternatives to dairy-based toppings, which have similar applications as their dairy-based counterparts. Non-dairy toppings include base ingredients such as vegetable oil, almond milk, soy milk, rice milk and hemp milk among others. Non-dairy toppings are available in various forms such as powder, liquid and frozen formats. The non-dairy toppings market report is a comprehensive assessment of various key facets circling non-dairy toppings, including drivers, restraints and trends. The non-dairy toppings market report provides analysis on every segment of the market providing a holistic touch to the report. The report on non-dairy toppings market also covers historical data, current non-dairy toppings marketplace and future highlights on non-dairy toppings with respect to sales and demand. The non-dairy toppings market has been segmented in detail to cover every angle of the non-dairy toppings market impacting its growth. 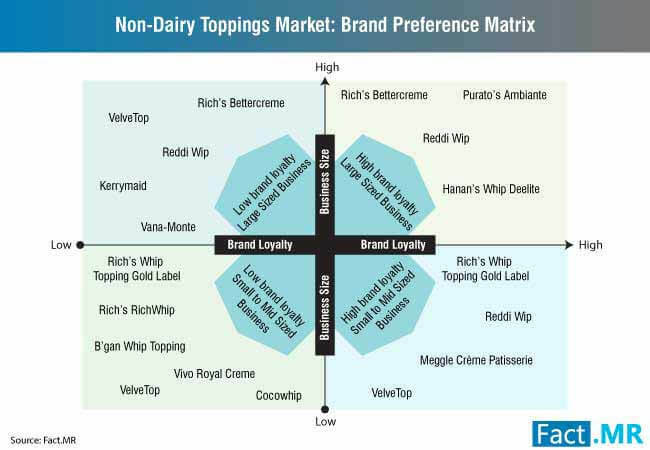 The non-dairy toppings market is segmented on the basis of base ingredient (soy milk, vegetable oil, almond milk, coconut milk, others), by form (liquid, powder, frozen), by application (bakery, confectionery, processed fruits, frozen desserts, beverage, others), by type (whip cream, pouring cream, spooning cream, others), by distribution channel (direct and indirect – modern stores, specialty food stores, e-commerce, others) and by region (North America, Latin America, Western Europe, Eastern Europe, Japan, Asia Pacific excluding Japan and Middle East and Africa). Which is the most lucrative region that non-dairy toppings manufacturers can tap to gain profits? Which is the most preferred form of non-dairy toppings by end consumers? Can sales of non-dairy toppings through direct channel surpass those from indirect channels? Which is the most preferred non-dairy toppings type in the global arena? Which ingredient of non-dairy toppings is likely to gain significant traction in the coming years? The report on non-dairy toppings market is drafted using a unique blend of primary and secondary research methods. The research methodology used in analyzing non-dairy toppings market enables a highly accurate data using which key insights on non-dairy toppings market are drawn. Moreover, the non-dairy toppings market is a triangulated compilation of information and data gathered using external sources and primary and secondary research. 16.5. Hanan Products Co. Inc.